Whispers in the Loggia: Halifax Gets a "Tony"
Up North in the Canadian Maritimes, yesterday saw the installation of Halifax's new archbishop, the Italian-born Anthony Mancini. Topping the new archbishop's schedule of emotional farewells before his departure was his final "Monday with Mancini" last week at Montreal's McGill University Newman Center. For the last few years, most Monday nights saw "Bishop Tony" -- a pastoral theologian by training -- keep a standing commitment for two hours of pizza and casual conversation. The free-flowing meet-ups quickly became one of the center's most popular activities. Inheriting a local church of 165,000 whose profile and energy-level were significantly upped by his predecessor -- Terry Prendergast, now the archbishop of Ottawa -- Mancini will continue the practice of recent years in serving, by papal appointment, as apostolic administrator of Yarmouth. The diocese of 36,000 at the province's southern tip has been without a resident bishop since 2001, at which time its oversight was given to the Halifax prelate. In addition to the formal announcement of the reported-below -- i.e. Marx to Munich, Tighe and Scotti to Social Communications -- this morning's Roman news-drop also reveals the naming of Fr John Corriveau, the longtime Minister General of the Capuchins, as bishop of Nelson, British Columbia. Corriveau, 66, succeeds Bishop Eugene Cooney, whose age-induced retirement was accepted. 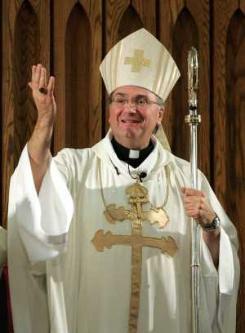 The bishop-elect held the Caps' top post from 1994 until last year, having served the maximum tenure of two six-year terms. And, lastly -- for you ritual fans out there -- don't forget Crookston later today.